Trivia: There are 133 F-words in this movie. Trivia: The first time they filmed the part with Josh's teeth and flannel in the sticks, the directors had left it outside the tent, not telling Heather. When she got up in the morning, she picked up the bundle of sticks and threw them off to the side without looking at it. They had to contact her and re-shoot it. 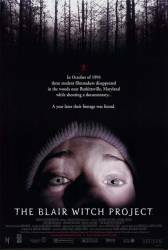 Question: Why is it that we never see the Blair Witch? Also the cover is very convincing that this is a true story. Is it? Chosen answer: The Blair Witch does not exist. The reason you didn't see is it is an abstract concept. What you can't see is scarier because you make her up in your own mind. It is a complete hoax of a story. The three actors have been doing many other acting jobs since, especially Heather and Josh.